Sun, cathedrals, street vendors, men in capri pants, women in Zara, late nights, cobblestone streets, horse-drawn carriages, gypsies with rosemary, tinto de verano…these are the characters and images that populate the streets of Sevilla in September. I’ve been here in Spain for 11 days. In that time, I have signed the lease on an apartment, walked a good portion of the city, eaten copious amounts of gelato (with an occasional break provided by frozen yogurt from Yogurtlandia!) and managed to embarrass myself a couple of times with my rusty Spanish. I am here to be a language assistant in a middle school in Jérez, a town of 250,000 south of Sevilla known for its equestrian school and sherry bodegas. I’m living in the historic city center with my roommate from college, Julia. 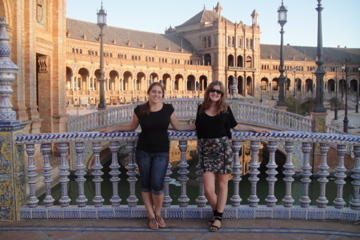 She’s teaching in a teeny-tiny town northwest of Sevilla called Valverde del Camino. It’s famous for its leather goods. Here we are in the Plaza de España, an impressive tiled wonderland built for the 1939 Ibero-American Exhibiton. It’s surrounded by a gorgeous Golden Gate Park-like place called Parque María Luisa. 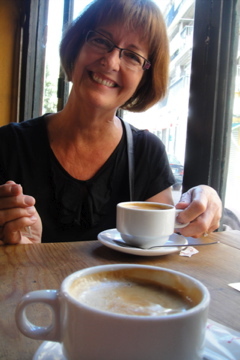 For the past 10 days my mom was here helping with the apartment search, general settling into Sevilla matters and, of course, to do a little sight-seeing. This picture was taken at our adopted breakfast spot, Bar Alfalfa (yes, a bar is a perfectly respectable place to have breakfast here and yes, people are sometimes actually drinking at 11am on their work breaks!). This particular bar has amazing café con leches, fresh-squeezed orange juice and tostadas (toasted mini-baguettes with different toppings like tomato, cheese, ham, etc. and usually olive oil) for amazing prices. I have been there 10 times already! My mom left on Saturday, and Julia and I are already missing her- she was a strong connection to home! I am so excited for this journey, and also anxious. I look forward to sharing it with you all! Thanks for stopping by the blog and please never feel shy to leave a comment! That would be amazing! We just got a 3rd bed, so visitors don’t have to sleep on the couch!!! i’m so happy you’ve started your blog! i love it already!